If you’re familiar with the phenomenon of cyberpunk you know what I mean when I say that the entrance and exterior of Revoltosa reminds me of just that. The interior not so much. It’s a great place to go to if you’re just out to have a drink with a friend or if you’re a larger group celebrating a birthday or any type of life event. The food appears as though it’s been customized for sharing between a set of people. 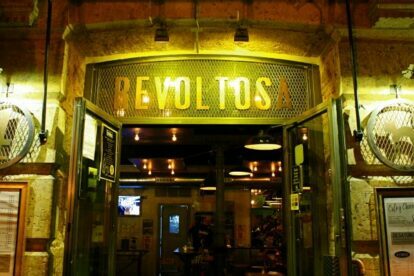 Since I came to Revoltosa the first time I have been back a minimum 2 times a week and tried a greater range of their kitchen. I myself am a huge fan of salmorejo which is a cold tomato soup similar to a gazpacho but contains only the tomatoes and not the other vegetables. It’s a very popular dish due to the heat in the summer and you should definitely not miss out on it if you go here.